Location, location, location! It doesn't get much better than this. No matter what you would like to spend your vacation doing, our home is just minutes all of it! It is located near the end of a quiet, dirt road. Although you have peace and quiet for relaxation, you are conveniently located to any of the Mount Washington Valley's attractions. There is also neighborhood hiking access to Mt. Stanton and a PRIVATE association BEACH located on the Saco River which allows for fantastic outdoor recreation AND we are PET FRIENDLY!. Attractions/Distances: Attitash Mountain, which features the largest zipline in the Northeast (2.4 miles); Story Land (2.9 miles); Wildcat Mountain (15.9 miles); tax-free shopping at Settler’s Green in North Conway (10.2 miles); Bretton Woods (23.1 miles); Cranmore Mountain Resort (8.3 miles); Kancamagus Highway (19.5 miles); Mount Washington Observatory (24.5 miles); Diana’s Baths (5.3 miles); Kahuna Laguna indoor water park (8.9 miles); Cathedral Ledge (6.8 miles); Conway Scenic Railroad (8.1 miles). Amenities, amenities, amenities! This beautiful and extremely bright open concept home features cathedral ceilings, TWO living rooms, FOUR bedrooms, THREE full baths, ample parking, an indoor gas fireplace and outdoor fire pit, and a Weber gas grill on an oversized 28' deck. NEW IN 2017 – TWO 65" mounted flat screen television (one for each living room). The home has a fully equipped kitchen with built-in microwave, stove, coffee maker, toaster, crock pot, cookware, and dinner ware set. The dining table has seating for six and there is additional seating for four at the island. In addition to a fully stocked kitchen, you will find most, if not all, of the staples necessary for cooking (spices, flour, sugar, salt, pepper, condiments, etc.) There are linens and towels for our guest to use if needed. All beds have new mattresses and pillow protectors, comforters and allergen barrier hypoallergenic pillows. The third -floor master bedroom has a New KING-sized bed with private full bath and flat screen television. There are two bedrooms on the main level. The first has a Queen-sized bed with a flat screen television. The other bedroom has two twin beds with a flat screen television and share the 2nd full bathroom. This main level also includes the open concept family room, kitchen & dining area with access to large wrap around deck with patio furniture. After renting in the White Mountains for years, our rental sold- we decided to build our own second home to share with our guest. We fell in love with the location and purchased a lot of land. We designed & built the home with a comfortable layout to accommodate our guests without feeling crowded. There are 3 levels to the house - each level has a full bathroom. We enjoyed our stay at the house. Everything worked well and we did not have any problems. The house has a very convenient layout with the entrance at the lower level and living and dining rooms at the second level. Downhill and cross-country skiing places as well as a supermarket were within 5-10 minute driving. The only concern the new renters must have in mind is that the house location is not shown correctly by the Google Maps. So, you need to pay attention to the directions provided by the owner, which are easy to follow. Perfect home base for a family stay! We were back in NH to visit with family and this was a great place to stay. Close to town and attractions but feels like you are in the woods. Clean and roomy, games and TV for kids. We really enjoyed being able to spend quality time here. Kitchen was well stocked with utensils to cook. Deck was perfect for relaxing and grilling. Firepit in the back was great for smores at the end of the day! Kathy and Craig answered all questions fast and ahead of time made for a very easy trip. Would definitely recommend for a family stay! Unbelievable! 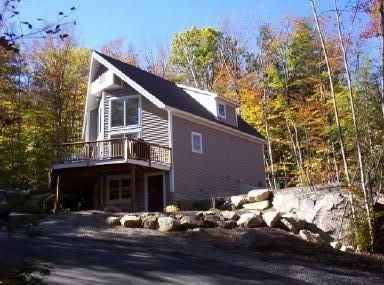 Gorgeous home, warm and spacious, in the middle of all the mountains, close to all the attractions, yet in the middle of nowhere setting. Beautify setting for an evening campfire listening for calls of friendly black bear and moose. If your looking to stay in that area you will never regret it! Enjoyed every moment of our stay! The property was everything it promised to be. It was conveniently located near all the sites our family wanted to visit during our vacation. The house accommodated our family of grandparents, pet, daughters and their family. The house was welcoming and came with a valuable manual of information. Our 5 year old grandson loved the Foosball Table and our three year old granddaughter loved playing on the deck. Our vacation renewed our love for all things New Hampshire! Thanks for a warm, clean, comfortable and homey place to call home for the weekend! Less than 2 mile to Attitash Mtn, short walk to huge private beach on Saco River, Just minutes away from Story Land & all that N Conway has to offer! Hiking, golf, shopping, dining - all right there! It is much more than the typical vanilla rental/condo you will find with dated furniture and cramped sleeping arrangements w/ sleeper sofas & lofts. This luxurious chalet can accommodate a larger group or 2 families w/out crowding or bumping into each other. The layout allows adults to relax by the fire, 42' FLAT SCREEN TV, w/ Blue Ray DVD while the kids or other group hangs out in the lower family room with TV/DVD and Wii Game system. This spaciousness also helps when stuck inside on bad weather days or in the morning so early risers do not disturb the whole house. Our chalet is very centrally located within mins. of 8 - 10 excellent fine dining & family restaurants / pubs with real NH character& ambiance. 3-4 of the pubs regularly have live music on weekends.